For the wargame weekend with Old John and Richard I set up a table with winter terrain on it which could be used for anything from ancients through to Russian Civil War and quickly wrote up three scenarios for the former. 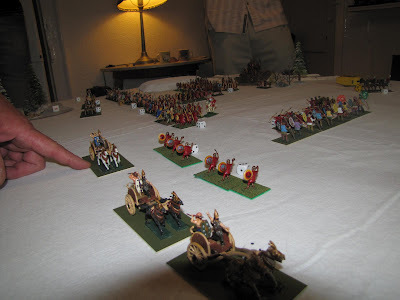 My plan was to start with a game in which Alexander, leading a fast moving task force, cornered some Persians in the mountains of Bactria, follow it with a Terry Wise-inspired battle in the Abruzzo involving Hannibal and some unhistorical Roman legions and finish with a more traditional clash between the Imperial Romans and the local Brigantes. Since Friday night also drew Clive and Stephen into the cramped environs of the Longuelade bivouac the table for this first game was small - just four feet by four feet - and for reasons that I can't now recall amongst all the yelling we began with the Celts and Romans. Richard and Stephen commanded the Imperialist invaders determined to impose their alien way of life on the natives, while Old John and I took charge of the noble freedom fighters. Clive Norman was the war artist/umpire. The Romans had thrown a pontoon bridge across the Tyne. Some of their army had crossed to the north bank, while the rest would arrive at some point in the future. Celtic opposition was likewise arrived or arriving. All this was determined by dice throws, which - predictably - didn't seem to go well for the Brigantes. The ensuing action was confused. Suffice it to say here that the Brigantes chariots capered about the place looking impressive andheroically manly but achieving very little. The Celtic cavalry met with more success and drove the Roman light horsemen back across the bridge. The Roman infantry was made of sterner stuff and easily dealt with the roaring warbands, who retreated back towards what is now Wark.